In case you didn't know by now, Liverpool (my sources tell me it's a football club) has won the Champions League this morning! I was still fast asleep when that happened. *yawn* But my hyper Daddy was so happy that he was jumping up & down around the house! Pengz... 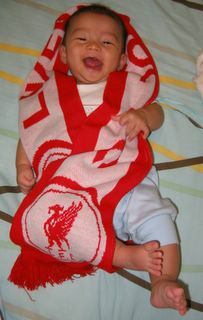 He's a Liverpool supporter by the way, since when he was a young boy. So that probably explains the highly emotional response. haha... And he couldn't get back to sleep after the match, cos he was too delirious! Well, as long as I can't have an opinion of my own yet, I guess I've to support Liverpool too. Not that I mind lah, judging from my face... GO REDS! hee. Erm, Daddy, excuse me hor.... your scarf how long never wash liao har? 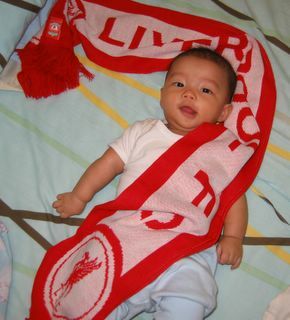 Haiz, think I popiah ah...wrap here, wrap there... -_-"
GO LFC those are the cutest pics!!! !